We are excited about our new section devoted to Classic Motorcycles and are continually adding new titles. Description: 184 pages, 95 black & white illustrations, size 5.5 x 8.5 inches. Originally published under the similar title, The Book of the Matchless, by W.C. Haycraft. This book is one of The Motorcyclist’s Library series published in the USA by Floyd Clymer by arrangement with the original publishers, Pitman Ltd. of London, England. This re-print of the 1931 edition of the ‘Book of the Matchless’ was selected as being a significant edition as it is the only edition in this series that includes detailed overhaul, repair and maintenance information for the 600 c.c. O.H.C. Silver Hawk V-Four, the 400 c.c. S.V. Silver Arrow V-Twin and the 990 c.c. X series ‘Big Twins’. This information was omitted from the later editions which were also re-titled as ‘The New Book of the Matchless’. The 1931 edition was later updated by the addition of a ‘bound in’ detailed 1933 supplement and subsequently a ‘laid in’ 1936 supplement. The inclusion of these two supplements basically ‘extends’ the information such that it covers all the pre-war models through 1939. In addition, as the post-war models (re-introduced for the 1945 season) were confined to 350 and 500 c.c. O.H.V. 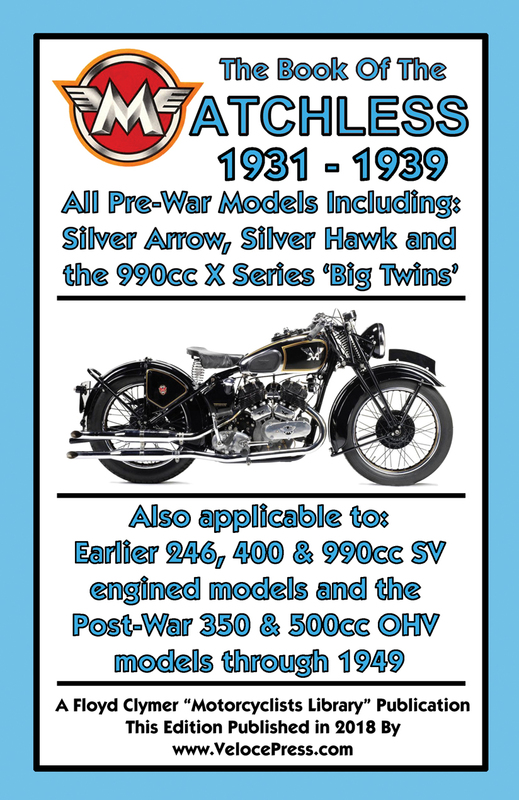 singles, much of this same information is also applicable to the models manufactured through 1949, making this one of the most comprehensive publications for both pre-war and post-war Matchless motorcycles. In addition to the 600 c.c. Silver Hawk and the 400 c.c. Silver Arrow, this edition includes complete technical data, service and maintenance information and detailed instructions for the repair and overhaul of the 250 c.c. (S.V.) R7, D7, F7 & G7 models, the 250 c.c. (O.H.V.) DS, D2, F4, G2 & G2M models, the 350 c.c. (S.V.) model D, the 350 c.c. (O.H.V.) D6, D3, G3, & G4 models, the 500 c.c. (S.V.) D5 & G5 models, the 500 c.c. (O.H.V.) CS, D80, G80 & G90 models, the 600 c.c. (S.V.) model C and the 990 c.c. (S.V.) X3, XR3, X4 & X models. Obviously, the 250, 400 and 990 c.c. S.V. data is also of considerable use to owners of the earlier models that utilized those same engines.